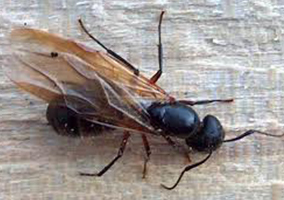 In the northeast, carpenter ants can cause more damage to structures than termites. The rural setting of Pike County, Pennsylvania is the perfect setting for carpenter ant intrusion. Being surrounded by dense forest Dingmans’ Ferry, Shohola, and Milford Township, are in a carpenter ants’ prime habitat. Unlike ants you’ll see on the sidewalk, these ants will often make nests out of trees by hollowing them. A queen, who begins a nest in a piece of old buried wood, or in a partially decayed tree or stump, forms a carpenter ant colony. A carpenter ant colony live in a very structured order called a caste system. A caste is a group of insects that each has a specialized role in a colony similar to honey bees in a hive. In a carpenter ant caste, there is a queen, winged male reproductives, worker major, worker medium, and worker minor. These pests are fairly difficult to control and are often associated with structural wood damage. Furthermore, the damage can happen in a very short amount of time. As they favor moist wood, water intrusion will cause wood damage and the carpenter ants will only further this. Being omnivorous they eat many different types of food, including plants and animals as well as their own dead. Unlike termites, they do not actually eat the wood but rather excavate galleries within the wood to use as nesting sites. The next time you see a fallen hollowed out tree the damage is most likely done by carpenter ants. In mature infestations, there may be as many as ten satellite colonies or more, linked to the parent/main colony by pheromone trails. There is a frequent exchange of workers between these satellite colonies and the main nest. Worker ants will forage for food, shelter, or water as directed by the queen. Their sphere of influence can be as large as 200 to 300 feet away from the primary colony. Colonies normally do not produce winged productive until they are at least three to six years old. One sign of a carpenter ant infestation is the discovery of wood shavings similar in texture to pencil shavings. We call this material “wood frass” or just frass. Upon closer inspection of the frass, you may notice parts of ants, i.e. head, body segments, and perhaps some legs. This is how we tell the difference between carpenter ant frass and construction frass. There are times when the evidence of carpenter ants is not noticeable or visible. Sometimes their presence can go on for long periods of time without being noticed. They can nest comfortably between exterior plywood sheathing and the foam wrap of vinyl siding, chewing and removing the foam insulation as needed. If the chimney flashing has been compromised, moisture can get in, causing a suitable spot for nesting. A very insidious spot is when they nest between the roofing shingles and the sub-roofing. The roofer will find this one as he replaces the roof. Foraging activity can occur during the day but usually peaks at night. The ants achieve pest status when a colony invades the wood of a house, causing damage and being an overall nuisance. If winged ants are seen, there is a colony not far behind, this is a very important warning sign, not to be ignored! Structural damage can be intense by the time external damage is visible, such as sawdust or bubbling paint. Houses located near wooded areas, or brush covered vacant lots, are good candidates for infestation. The most common way in which a home becomes infested is through emigration of an existing colony. Carpenter ant colonies are inclined to move if they are disturbed, as often happens during construction. Thus, new homes or those surrounding a new building lot are likely locations for attack. Carpenter ants can forage great distances from their nest for food, water or shelter. As mentioned 200 to 300 feet from the point of origin. When food or shelter is found these “Scout ants” will provide a scent trail (pheromone trail) back to the main colony, recruit other ants, and follow the pheromone track back to the source of food or shelter. They are very cryptic in their behavior; often they are the most active between the hours of 10:00 pm & 4:00 am. Their presence and damage can often go undetected for long periods of time. Homeowners will often try to solve this problem by way of home remedies and/or over-the-counter products. Sometimes this is successful but usually, it makes the situation worse by either causing the ants to scatter to new locations, or go dormant as long as 7-9 months. When trying to solve the problems themselves, homeowners will often use products that are counterproductive to professional efforts. Carpenter ants are hardy insects with strong nesting and foraging behaviors. These insects can cause structural damage and require diligence for proper control. Here are some important facts regarding the materials we use, as to better understand what we do and why we do it. The residual (effectiveness) of the materials that our industry has available to use today is roughly 3 months, possibly less. Repeat applications are necessary to maintain a protective barrier. Proper maintenance of this barrier can greatly reduce the likelihood of infestation. As the protective barrier begins to break down, foraging ants can begin to re-establish trails back to your home. These trails can be across the surface of the ground next to your home, on wires connected to your home, or tree branches touching your home. This strong foraging behavior and the length of the residual of the materials used is why we recommend at least 3-seasonal applications. Out Tier 1 program that includes 3-seasonal applications, provides protection against these pests when they are most active. For carpenter ants: Spring – is the first emergence when carpenter ants are looking for food for the colony. The colony is typically in the woods or forest. Summer – the height of activity often foraging for food, water, and shelter. Fall – the time in which insects prepare to “overwinter”. Shelter becomes the dominant theme this time of year. We at Masters Pest Control are professionals in all things pest-related. Masters is a family owned an operated business, which means we treat our clients and their homes with the same honesty and respect we’d want for ourselves. We offer full-service pest control and prevention programs, including carpenter ants extermination and prevention. If you would like additional information regarding carpenter ants we can provide that for you upon your request. Ask the Masters! Contact us now for more information, or to schedule a service. You will find that our office staff is courteous and professional and will be able to answer many of your questions over the phone. Our response is prompt and our service technicians are neat, professional and respectful.